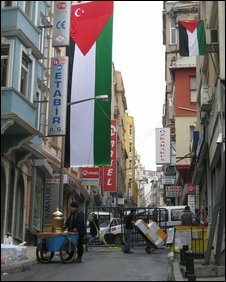 In the street outside a central Istanbul synagogue, traders have hung huge Palestinian flags. They have sewn the Turkish national flag to the top - a mark of solidarity for those suffering in Gaza. "We are all Palestinian now," Mustafa says. "Why is no-one stopping Israel?" Graffiti daubed in red paint on a nearby fence reads: "Child Killer Israel." It's just a fraction of the fury here at Israel's bombardment of Gaza. Across the country, there have been regular demonstrations - some tens of thousands strong. Outside the Israeli consulate, there is a noisy round-the-clock protest where demonstrators burn Israeli flags and throw eggs. There was a small explosion on Monday at a nearby bank that's part-owned by Israel. This week a teachers' organisation from Antalya sent a shoe to the consulate, as an insult. Most outspoken though has been Prime Minister Recep Tayyip Erdogan himself. He has referred to Israeli action in Gaza as "savagery", "a crime-against humanity" and "state terror," and warned Israel that it will "reap what it sows". "People say my statements are too harsh," Mr Erdogan said on Tuesday. "They are no harsher than the phosphorus bombs used by Israel. "Civilians and children are dying in Gaza," he added. "Those who keep their silence over these attacks out of whatever concern or for whatever diplomatic reason, will pay the price before history." With local elections due in March, a weak stance on the Gaza offensive could lose Mr Erdogan's AK party crucial support from more religious voters. But the prime minister's condemnation of Israel strikes a chord with most Turks, devout or otherwise. It is difficult rhetoric for Israel to swallow from an ally. Turkey was the first mainly Muslim country to recognise Israel. In 1996, the two countries signed an agreement forging strong defence and intelligence ties. But Israel's offensive in Gaza has caused outrage. "There is a great deal of disappointment that there has not been one word of sympathy from Turkey about the Israelis," a senior Israeli diplomat told the BBC. "Its rhetoric has entirely sided with Hamas. Even the Arab countries talk about the need for both sides to stop the violence." In power since 2002, Mr Erdogan's party has worked to boost Turkey's role in the Middle East. It has cultivated closer ties with Iran and Syria as well as Israel. Immediately after the Hamas election victory of 2006, Turkey invited its leader, Khaled Meshaal, to Ankara - arguing the importance of engagement over isolation. "I am sure the AKP's own religious background plays a role here, but its policy is that you have to reach out to everyone," says Soli Ozel, international relations specialist at Bilgi University. That approach helped Turkey mediate pre-talks about peace between Syria and Israel last year, now abandoned. But some argue that Turkey has now compromised its "honest-broker" credentials. "The prime minister's language has damaged Turkey's policy of equal distance from all partners," Mr Ozel says. "[That] can soothe burning hearts in Turkey. But it limits any steps Ankara can take, or its influence in the future." Turkey's position has won it a crucial role in the Gaza ceasefire talks, though. The prime minister's chief adviser has acted as the central conduit to Hamas, shuttling between Damascus and Cairo as Egypt tries to negotiate with Israel. UN Secretary General Ban Ki-Moon is expected to discuss that process during his visit here on Friday, including details of a mooted international monitoring presence on Gaza's border. Turkey has already volunteered troops. "We will contribute to a monitoring force," foreign ministry spokesman Burak Ozugergin confirms. "But we did not offer any contribution to a peacekeeping force. That is a whole new ball game. We can discuss it if we arrive at that point." Every day, the Turkish press carries graphic reports of the suffering in Gaza. Local aid agencies have sent truckloads of aid in response. The education ministry called an unprecedented minute's silence in all schools this week for children dying in Gaza. Anger at Israel has at times spilled over into anti-Semitism. Israeli diplomats say protesters delivered a petition on Tuesday calling for the expulsion of all Israelis from Turkey and warning that they have a list of Jewish business people to circulate. Graffiti on one city wall reads: "We don't want you in Turkey. Whore. Zionists. Scum." Angry themselves at Turkey's attitude, Israelis have reportedly cancelled business and tourist trips here. But both sides agree their relationship will survive in the long run, when Turkey has ambitions of helping to reconcile the competing Palestinian factions Hamas and Fatah. "It is in the interest of us both to maintain good relations," an Israeli diplomat explained. "But politically it will take a long time for things to return to normal." Despite the prime minister's passionate denunciation of Israeli aggression in Gaza, Turkey has notably avoided any sanctions on Israel, economic or diplomatic.